Welcome Bonus: Casimba will match 200% of the value of your first deposit up to $/€500. New players also receive 50 free spins on Starburst. Deposit Bonus: Bonus’ for the second and third deposit. On a player’s second deposit Casimba will match 25% of their deposit, up to the value of $/€1000. 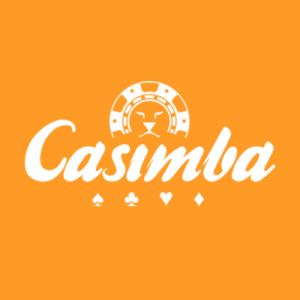 Whilst still a relative newcomer to the online casino world, Casimba has already gained an impressive reputation and a large fan base. This is largely down to the fantastic welcome offer Casimba gives its new players, which continues up until the third deposit made, encouraging players to keep playing and keep exploring all the site has to offer. With over 500 games from over 25 different software developers, Casimba is able to showcase the best of the best in regards to casino gameplay. Players are able to explore classics, as well as games developed by renowned software developers NetEnt, alongside more quirky indie creators. Casimba offers a 24-7 live chat support service, as well as an e-mail service, meaning you can play worry-free, both on your PC and on mobile devices, as the Casimba website is mobile compatible! Casimba also offers a variety of payment options, including e-wallet and credit/debit card with methods accepted including Maestro, MasterCard, Neteller, Paysafecard, Visa, iDEAL, Skrill. Casimba is only available for a select number of countries including the UK, Finland, Norway, Germany, and Sweden, and features web pages in a variety of languages including; English, Finnish, German, Norwegian, and Swedish. Unlike most online casinos, players from the US and Australia are restricted for using Casimba, which of course for players from this region can be considered a negative, but for those from permitted countries, Casimba is able to offer a linguistically inclusive, more intimate community, and gambling experience when compared to its global counterparts. Casimba does have a slightly higher minimum deposit of $/€20, but when you consider the wealth of benefits players receive over their first three deposits, in the long run, this slightly higher deposit requirement becomes almost inconsequential. Casimba is most well known for their almost unbelievable welcome offer, and subsequent deposit offers. On a player’s first deposit, Casimba will match 200% of the value of the deposit up to the value of $/€500, which is one of the highest welcome rewards currently seen online. But, to add even more sugar to the pot, Casimba also gives new players 50 free spins on the classic Starburst, and then finally, Casimba additionally provides a second welcome offer of 20 free spins on Fortinum Slots, which can be redeemed in concurrence with the previous amazing offer. Following this initial welcome offer, there are two further bonus’ which players can receive upon their second and third deposits. The main promotion which Casimba currently offers is a draw to win a ‘dream holiday safari in South Africa.’ Entries to the draw are gained by earning 1,000 ‘Casimba Points’, which are gained through depositing and betting. Each entry ticket requires 1,000 Casimba points. Casimba offers both VIP and loyalty programs. Casimba’s loyalty program revolves around ‘Casimba Points’, which player can earn as they deposit and wager. Players receive 500 free bonus points at their first deposit to get them started off. Every $/€10 earns 1 point, but to earn this they must wager $/€20. Casimba points can be redeemed in 1,000 increments and can be used towards promotions or as a bonus value of $/€5. The VIP membership program at Casimba offers is split into four tiers with the top tier being called ‘Casimba VIP Elite’. VIP’s gain access to exclusive events and tournaments with high-value prizes, they also receive customized promotions based upon their play habits. VIP’s will also receive exclusive cashback offers, as well as social events and their own VIP account manager. Casimba has a 35 times wagering requirement to be completed before players can redeem their winnings from their welcome bonus of choice. While this is not the smallest of play-through requirement, when considering just how high the value of the welcome offer is, a 35 times wagering requirement seems fair. The only downside of Casimba is that unlike other sites they do not accept deposits through PayPal, however, Maestro, MasterCard, Neteller, Paysafecard, Visa, iDEAL, and Skrill are accepted. Casimba also accepts the following currencies for deposits, Canadian dollars, Euros, Norwegian kroner, New Zealand dollars, Swedish kronor. Casimba doesn’t specify the maximum withdrawals players can request at once, but the available methods for withdrawal include, Bank Wire Transfer, MasterCard, Neteller, Paysafecard, Visa, iDEAL, Skrill. A minimum deposit of $/€20 is required, whilst the maximum deposit payment Casimba will accept is unclear. The minimum transaction for withdrawal is $/€20, with the maximum amount that can be withdrawn also not revealed. Casimba also has a set of strict verification requirements. The first being email verification. Casimba will suspend accounts, and void winnings until this step is completed if it has not been done so within the first 72 hours. They also require age verification, AML verification, and some other verification checks. While Casimba’s terms of service do not directly specify the exact documents required, it is likely that you will need to upload the following documents. Credit card: A photo of the back and front of your credit card is required. When photographing the digits on the front of your card, ensure that only the first six and last four numbers are visible. It is likely you will require to prove you own the account linked to the deposit/withdrawal process. Proof of address is also required. Accepted forms of proof include bills, bank statements, or official letters or documents from a governing body. Your name, home address, and issue date should be clearly visible, and only documents received within the last 3 months are eligible to qualify as proof. Casimba has over 500 games available to play any time, anywhere on their online casino. Casimba features a wide range of slot games, including the classic Starburst, as well as titles such as ‘Spin Town’ and ‘Emerald Smash’. Casimba also has quite the selection of table games, created by a variety of different software developers, with all the classics such as blackjack, and roulette available. There is also a variety of niche games, including Punto Banco and Red Dog. Casimba has a large live casino with lots of games to play with a live dealer. The many variations of poker, blackjack, and roulette are available for players to wager on. Casimba does not offer a dedicated mobile app. Instead, the online casino has opted to make their main website accessible and compatible with mobile browsing, meaning its patrons can have exactly the same casino experience on their phones, as they do on their PC’s. Casimba protects its customers personal and financial details by using high standard SSL encryption. Casimba is licensed and regulated by two governing bodies, the UK Gambling Commission and the Malta Gaming Authority, as well as conforming to the laws of Curacao. Casimba offers a live chat support service which is available for clients to use 24/7. They also offer customers support via email. Casimba offers a wide range of games from an even wider range of developers, meaning you get the best cross-section of up to date online casino games, including both new innovations and old classics. Because the site was designed to work both on PC and Mobile, you can wager whenever and wherever you want, and should you have problems, then Casimba’s 24/7 live chat is sure to help you get back on your winning streak! If you’re looking for a newer online casino which is already making a big mark on the online gambling community, then look no further. Casimba’s amazing welcome offer and depositing offers help you start your gambling adventure with a bang, giving you maximum playability for your money.